India coasts on a post-feudal-colonial mélange of currents and tides, with the brigandage of opportunistic politics fed by our (the voters’) greed for short-term benefits. The result is grotesque populism and corruption in lieu of the deferred gratification of pleasing cities and countryside with the appurtenances of proper governance: sidewalks and drains, toilets, transport, administration and order. We must develop solutions with an integrated, problem-solving approach, not just wait. The 5 GHz regulations are exactly what we needed for a start. But we need a lot more, and not only from the DoT. This item of detail is almost like magic. The MoC has done something splendid regarding Wi-Fi. Its 5 GHz spectrum regulations have everything we could wish for. But it’s a first step — only the first. Much more is needed to reap the benefits. To put it in context, we now have a policy that enables effective broadband Wi-Fi hotspots, and profound changes in connectivity are feasible for the last mile in India, as in other countries. A high proportion of smartphone traffic abroad is over Wi-Fi. In the recent past, in the US it was around 70-75 per cent, while Japan was around 83 per cent, and Germany about 87 per cent.1 Traffic is offloaded from licensed spectrum, freeing it up for re-use. We have 605 MHz added in the 5 GHz band to the existing 380 MHz for Wi-Fi, and a removal of restrictions on external usage as in the US, so Wi-Fi will have much greater capacity. The ramifications, however, are ironic. These regulations could lead to a surge in economic activity, and consequent benefits from connectivity. But this will increase imports, which are already overboard on account of oil prices and technology imports, an aspect discussed later in this article. The increased activities in network installation and ensuing benefits will vary depending on supporting ecosystems of policies and practices. This applies within the communications sector as also at points of interface with other sectors, such as electricity and finance. To illustrate, in communications, consider an unlicensed band in most markets including the US, the UK, and Europe, namely the 60 GHz V-band. Whereas the Federal Communications Commission (FCC) in the US delicensed 14 GHz in this band for “wireless fibre” called WiGig, India hasn’t done so. Instead, another WPC2 notification in October delicensed only 500 MHz (61-61.5 GHz) at very low power. Devices abroad that use this band for 400-metre and 700-metre connections have channels of 2,000-2,500 MHz acting as wireless fibre links over short distances. These can’t be used here. Short-distance connections to Wi-Fi and wired networks in offices and residential, commercial and industrial complexes will need fibre or cable. This policy link is missing, perhaps because operators oppose it. The user network traffic bypasses operators to the extent that Wireless Internet Service Providers (ISPs) and other entrepreneurs set them up and collect charges, whereas operators have paid huge premiums for the spectrum required earlier. A solution that enables commercial deployment by licensed operators would solve this problem, although ISPs would have to go through operators as before. Another alternative could be to have unlicensed access to public wireless networks owned and operated by BSNL/BharatNet/CSC, or by operator consortiums, on payment of service charges by operators and users. The power situation, with a conscious shift towards more distributed, renewable (solar and, in some areas, wind) energy, with changes comparable to Wi-Fi/5 GHz in policies and practices. The financial system and non-performing assets (NPAs), including the steady revival of infrastructure projects. While dealing resolutely with malfeasance and fraud, nursing and reviving good infrastructure underlying the NPAs is crucial. A sorry plight, but if revivable infrastructure projects are allowed to fail, they end up as unproductive, wasted assets (a repeat of Dabhol), with negative multiplier effects. The imperative for the domestic manufacture of equipment to reduce imports. This is going to be an escalating compulsion because of our market size, unless we develop solutions that help balance imports, such as a compelling tourism strategy (but just think of the complexity of the ecosystem elements that need improvement) or communications equipment exports (equally complex). Meanwhile, we are on a path committed to curbing demand to contain the deficit: Battening the hatches, tightening belts, and waiting for oil prices to fall /exports to rise, keeping a wary eye on the current account deficit (CAD) because of imports, and inflation. This pressure may persist for months, possibly even years, restricting growth. Aren’t there feasible, growth-oriented initiatives, tempered by not exceeding reasonable bounds, including the CAD? 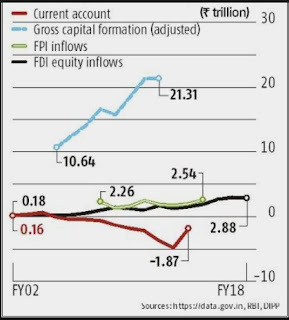 The data on the CAD, capital formation, FPI inflows, and FDI are in the chart below. A study of data from 2001 to 2016 of how the capital account and its components, the current account, and gross fixed capital formation affect each other concluded that sustained capital formation requires more foreign direct investment (FDI) relative to other flows.3 FDI was found to have an indirect effect on capital formation, which was found to affect the current account. Debt portfolio flows and nonresident deposits financed the current account, but did not contribute directly to capital formation. In Indonesia, a study of how the CAD affects exchange rates found that when it exceeds about 2 per cent of the GDP, the exchange rate depreciates over 12 per cent after a four-month lag.4 Tracking such relationships in India would be useful for policy making. Meanwhile, India’s large growth sectors are plagued by unsustainable economics. For sustained growth, they have to be organised more rationally, to generate profits for productive enterprises. Promising domestic sectors include electricity, communications, and aviation. Bypass strategies as in software and IT-enabled services won’t work, because these services are for domestic markets. They must generate profits without labour arbitrage, while balancing imports and exports, unless growth continues to attract foreign capital. Genuine reform as for Wi-Fi and 5 GHz spectrum with collaboration involving the private sector and governments modelled on the automotive sector are a possible way forward.